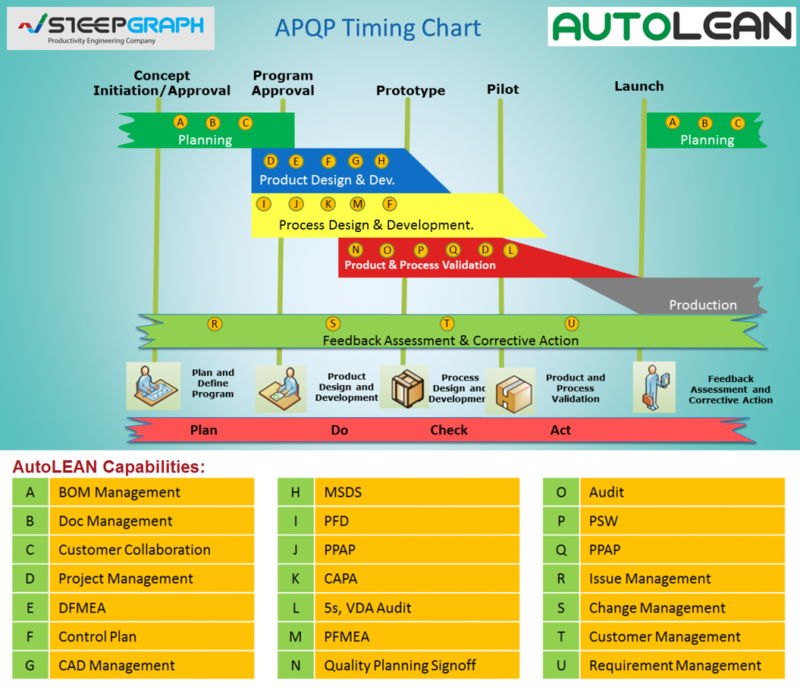 AutoLean - Automotive Supplier Solution - SteepGraph Systems Pvt. Ltd. » SteepGraph Systems Pvt. Ltd.
SteepGraph is an Agile, Result focussed, Quality conscious organization, striving hard to bring innovation and productivity gains to our Engineering and Manufacturing customers in PLM Space. SteepGraph has a deep understanding of business processes in various Industry verticals, helping us to bring tangible business benefits to our customers. SteepGraph is constantly putting its focussed effort to solve industry pain points and bringing productivity in every aspect of business. SteepGraph implements best industry practices in Industry Solutions to streamline your business processes and make your operations efficient. Our customers look at us as their extended team to achieve their PLM goals. Strong PLM experience, skills and quality delivery track record makes SteepGraph as preferred PLM System Integrator partner for our customers. We are committed to bring best value out of your PLM Investment. World Class Software Technology – Chosen by fortune 100 Product Companies. SteepGraph possesses expertise on the industry leading Software Technology and tools. We recommend proven and scalable technology which you can trust to build your future organization. Right technology shall decide your scalability & future competitive edge. SteepGraph believes in sharing the knowledge. Here is the repository of knowledge base on PLM and how it is helping customers worldwide for collaborative innovation and digital manufacturing. More than ever, getting to market quickly is a top priority for automotive OEMs and suppliers. Gone are the days when five years or more were needed to take a car from the drawing board to the showroom floor. Today, the industry goal is 12 months. The move toward production outsourcing adds to the challenge, making the supply chain longer and more complex. Customer demands for higher quality, improved safety, more features and lower cost further strain the industry. The Automotive Industry Action Group-which includes participation by Daimler Chrysler, Ford Motor Co. and General Motors-developed Advanced Product Quality Planning (APQP) as a way to ensure that product quality is maintained and customer requirements are fully met. APQP is designed to standardize the manuals, procedures, reporting formats and technical terminology used in the industry. APQP guidelines are intended to assist automotive suppliers in developing a quality plan that supports the development of a product or service that meets customer requirements. 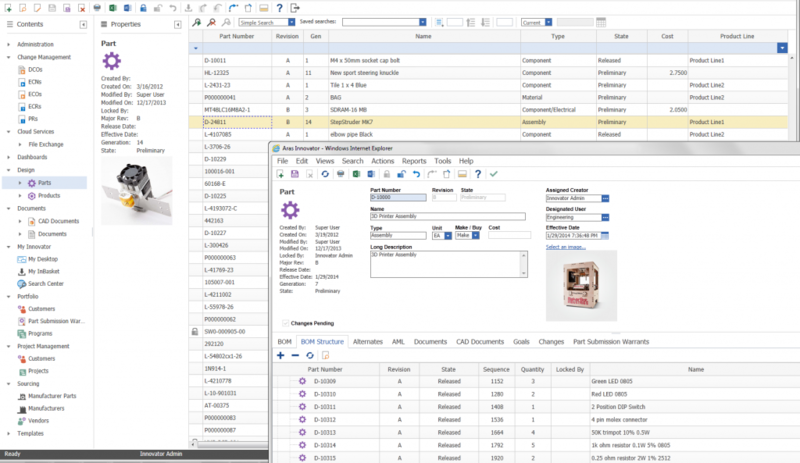 The automotive supplier solution runs on Aras Innovator applications and enables companies to maximize the business benefits of the Advanced Product Quality Planning (APQP) and the Production Part Approval Process (PPAP) by delivering them in a comprehensive enterprise PLM application. 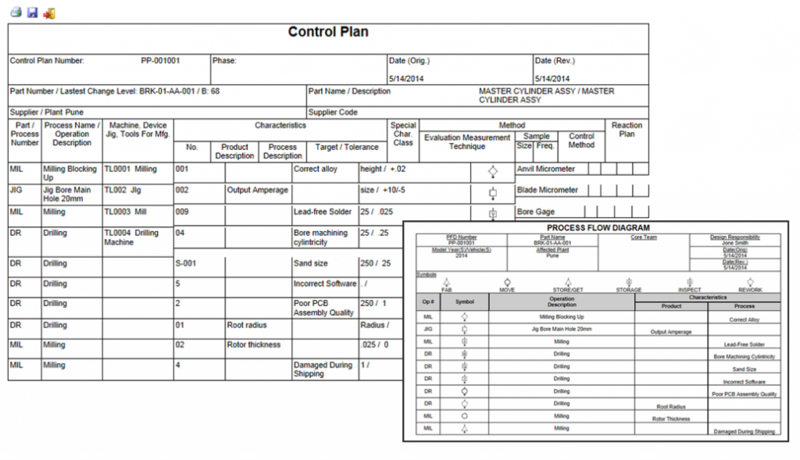 Standard Deliverables, including Design Failure Mode and Effects Analysis (DFMEA), Process Failure Mode and Effects Analysis (PFMEA), Control Plans, Process Flow Diagrams, Part Submission Warrants and more. 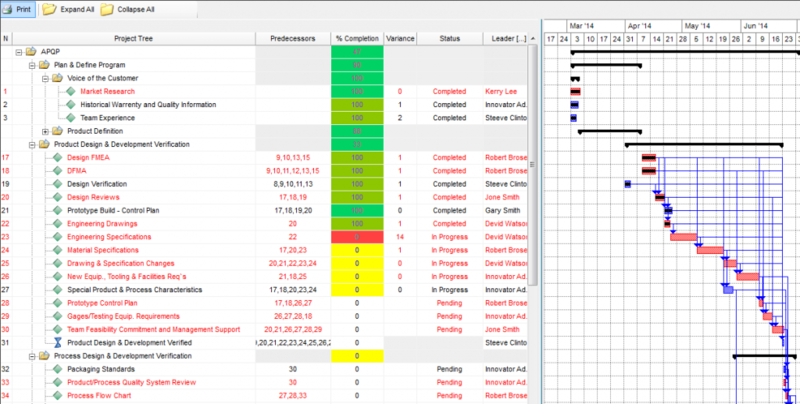 Program status dashboards roll-up actual work items to provide executive visibility and drill down capabilities. Secure Web-based project collaboration workspace enables collaboration while global team members work simultaneously. Closed Loop Processes for Feedback, Assessment and Corrective Action. 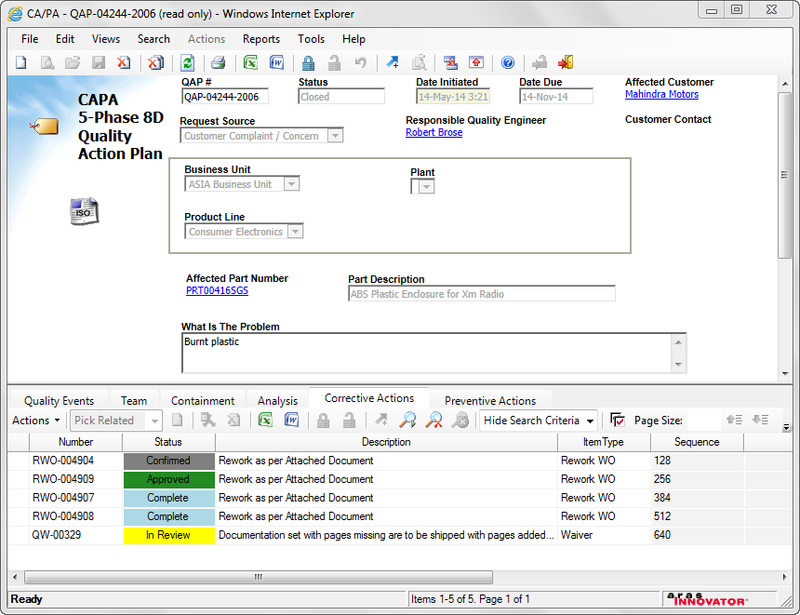 APQP templates provide ability to map multiple different corporate program structures that satisfy unique customer requirements. Supports compliance with TS/16949 / QS9000 [Automotive] and ISO standards. Integrated New Product Development and Introduction, Risk Management, Supply Chain Management, Product Data Management, Change Workflows and other processes. One of the key benefits of the automotive supplier solution is its ability to manage all functions of the APQP process, including program management, change management, and activity and task management from one interface. An organization can launch a project and send out tasks and activities to the people involved. 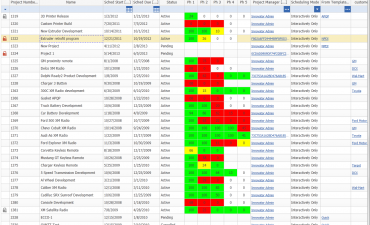 It also allows them to identify and monitor the critical path for the project. This improves the flow of information within an organization as operators can quickly access the information that relates to them rather than sorting through reams of data stored in several systems. The Automotive Industry Action Group which includes participation by leading automotive companies developed Advanced Product Quality Planning (APQP) guidelines as a way to ensure that product quality is maintained and customer requirements are fully met by suppliers. 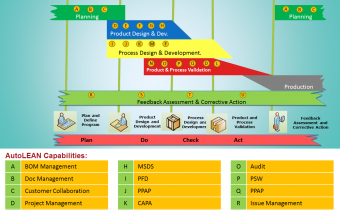 Advanced Product Quality Planning (APQP) is a structured method for defining and executing the actions necessary to ensure a product satisfies the customer. APQP is designed to standardize the manuals, procedures, reporting formats and technical terminology used in the industry. APQP guidelines are intended to assist automotive suppliers in developing a quality plan that supports the development of a product or service that meets customer requirements. To develop a consensus regarding international fundamental quality system requirements, the International Automotive Task Force (IATF) based on the APQP guideline developed the ISO/TS 16949 standards that was approved and published by International Organization for Standardization (ISO). The document is a common automotive quality system requirements catalog based on ISO 9001:2008, and specific requirements from the automotive sector. This document, coupled with customer-specific requirements defines quality system requirements for use in the automotive supply chain. 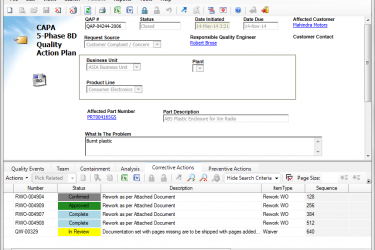 AutoLEAN solution maximize the business benefits of the Advanced Product Quality Planning (APQP) by delivering them on a comprehensive enterprise application. Adherence to the quality standard for the design/development, production, installation, and servicing of automotive related products (TS 16949) is automated within an enterprise IT framework. 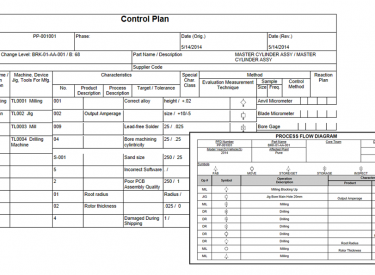 Standard Deliverables, including Design Failure Mode and Effects Analysis (DFMEA), Process Failure Mode and Effects Analysis (PFMEA), Control Plans, Process Flow Diagrams (PFW), Part Submission Warrants (PSW) and more. The goal of APQP is to facilitate communication between all persons and activities involved in a program and ensure that all required steps are completed on time, with a high quality-of-event, at acceptable cost and quality levels. 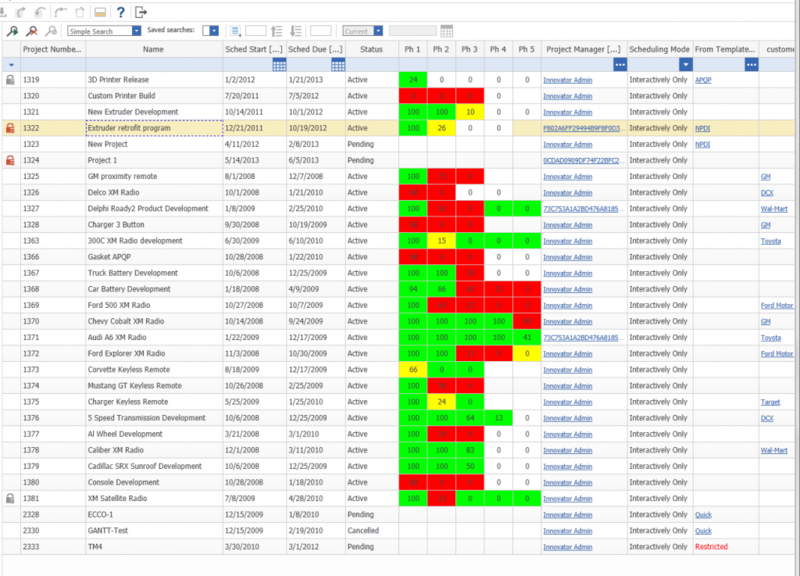 One of the key benefits of the AutoLEAN solution is its ability to manage all functions of the APQP process, including program management, change management, and activity and task management from one interface. AutoLEAN has Role based, Team based, Project based and Item based inbuilt security. It allows controlling the visibility and modification access to predefined groups, roles and project teams. With powerful access control, every customer’s data could be maintain confidential to project team only. AutoLEAN is powered by world’s leading PLM Platform – ARAS Innovator. ARAS is most advanced platform with model based SOA Architecture. 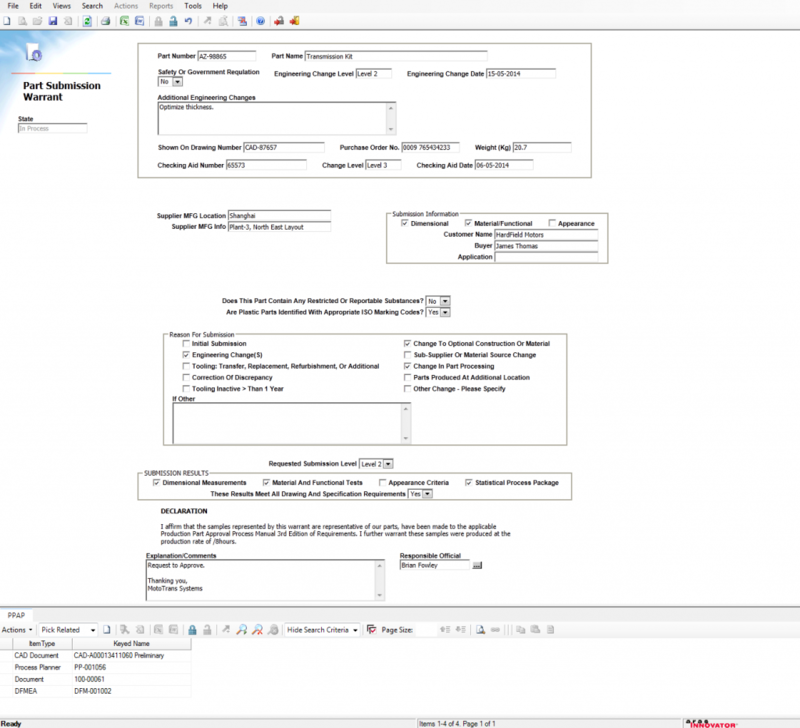 It enables AutoLEAN to easily integrate with SAP or and other ERP system. Using ERP system, Released data could be easily transferred to ERP for production. I worked with Steepgraph recently for a Swiss client to upgrade their mixed Matrix 10.5/10.6 MatrixOne solution to ENOVIA V6. The Steepgraph team mastered all technical difficulties with ease and worked restless to enable the go-live in time and in budget. With their well-structured and analytical approach they provided, whenever required, aggregated descriptions of technical problems together with the options to solve them, so that it was easy for the client and the DS project management to do well informed decisions. Finally it was a pleasure working with Steepgraph and I would always consider them as one of my first choices when staffing a project in the ENOVIA context. Thanks for your prompt answer and accepting to help us. I have heard a lot of good words about the work you did, so I am delighted to get your help! The POC will take place in….. Thank you very much to the SteepGraph team for their commitment and execution of the project deliverables. As a team you have displayed your technical competence, ownership and customer focus. The project was delivered on budget and schedule with minimal amount of Post go-live issues. 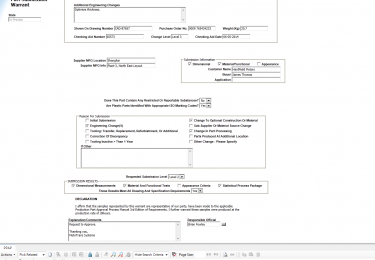 SteepGraph Systems Pvt. Ltd. provides expert consulting & technology services in niche market of product life cycle management (PLM) and Outsourced Product Development.